For a political party that markets itself as being the side with the expertise on economic issues, the Republicans are exhibiting a shocking ignorance on how the market sets prices. Case in point, Republican governors across the country are retuning to the concept of Nullification in regards to the Medicaid expansion in the Affordable Care Act. They are flat out refusing to participate the law, claiming that they are not going to expand health care for their poorest citizens. This not only deprives literally millions of people adequate health care it becomes a de facto tax on the rest of us. On a side note, the concept of Nullification was used by many of these same states to try to continue Jim Crowe era segregation. A policy that was once used to block African-Americans from sharing in basic American rights, like voting for a president, is now being threatened against this country's first black President to eviscerate his greatest policy achievement. I guess things never actually change. But to return to the point, not participating in this aspect of health care reform displays either complete ignorance or utter disregard that is so amoral that we might as well term it evil. I would hope that it is the first, but I fear that it is the second. 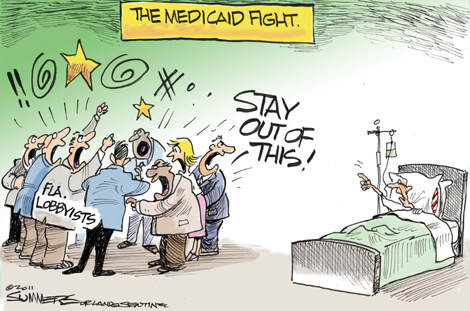 Medicaid, like Medicare and private insurance covers the cost of health care, both preventative and incident related. In fact, since many health care plans prior to the A.C.A did not cover preventive care under their private plans, Medicaid had some advantages of regular insurance. In short, it means that people who are sick can get treatment early in their illness, before a minor incident becomes a medical crisis. It also means that people can get regular care that might prevent a serious medical condition from developing or progressing. Without health care coverage, this is what happens: simple illnesses become severe; medical conditions that could be dealt with by lifestyle changes or simple treatments become debilitating crises. The cost in this lost productivity is staggering. A person who, through illness can no longer continue in their job creates costs that ripple through the business. Similarly, a person who continues to work sick is less productive, and if the illness is contagious, spreads that illness to coworkers and customers, causing a ripple of lost productivity. From a simple cost/benefit ratio, health care is the far cheaper solution. Some of you may say, Medicaid is for indigent people, and if they just got a job, they could afford health care. I have heard many Republican Congressional members say that it's their own fault that they don't have health care, and if they took personal responsibility for their lives, they wouldn't need to depend on the system. Basically, if they don't have health care, it's their own fault and it's all on them. And this is another aspect of failure to understand economic reality. Due to a couple of chronic, but not life threatening, medical conditions, I am what is considered a high risk individual when it comes to health insurance. As a result, my insurance runs close to $12,000.00 per year, and I'm glad to have it, because many people in my position don't have the ability to purchase insurance at any price, because of those pre-existing conditions. And so you know, this cost is just for me, no one else is insured by my plan. What this means is, if I had a minimum wage job, almost my entire paycheck would go to health insurance, taxes and F.I.C.A. I would only have about $3,000.00 per year to cover everything else; namely rent and food. I challenge anyone in this country to live on $250.00 a month for all of their expenses. Fortunately, I have a mother who is willing to pay for my health insurance, otherwise, I wouldn't have it. Some of this hopefully will change under ObamaCare, but for now, this is my reality; I am a 40 year old man, who makes a good living, and still has to get financial help from my mother because of the cost of insurance. The Medicaid provision covers this gap, by opening up the program to all people under 65 who have incomes of less than 133% of the federal poverty line. There are many people across the country working in minimum wage jobs, and without this government program, they will have no access to health care at all. But this is not even where the worst failures to understand economics lie for the Republicans. For that, we have to go back to the idea of how profit works in a market economy. In business, income must exceed expenditures. In other words, you need to bring in more money than you spend on things like your building, the cost of the wages of your employees, utilities, supplies and anything else that costs you money. When outflow exceeds income, you are either going to go bankrupt, or you are suddenly a charity, whether or not that was your intent. This should be something that most people understand. Now, when people come in and take your services without paying, they add to your overhead, instead of adding to your profit, they help move you to bankruptcy. You can also make a case that they are stealing from you, as many Republicans and health care C.E.O. 's have decided to do. Because they view sick people who happen to also been poor as criminals, they are now stationing debt collectorsin Emergency Rooms to make sure that incoming patients show them the money first. If they can't, they are sent elsewhere or they literally get dumped on the street corner. However patient dumping, even though it is done by many hospitals, is actually illegal. This means that most emergency medical care facilities treat even people who cannot pay. Publicly funded hospitals, like Denver Health, who have to treat anyone who walks through the Emergency Room door become the medical provider of last resort. Since most of the working poor cannot afford health insurance, and prior to the A.C.A., they did not qualify for Medicaid, they only way they could get medical treatment was in the emergency room. Typically, because of this, they were far sicker, and far more expensive to treat, than they would have been with access to preventative and maintenance health care. This is where the worst failure of the Republican understanding of economics comes into play. The poor people, for whom the E.R. is their primary care provider, cost a lot of money to treat. Far more, typically, that it would cost in a regular doctor's office, and for medical conditions that are better suited to the office than the hospital. This is because a trained E.R. staff, and the facility itself are vastly more expensive than a traditional primary care doctor's office. To understand how much an E.R. visit costs, just for a simple routine emergency, a few years ago, I cut the tip of my nose open on a car door at 11:30 at night. Since it was deep, and I knew I needed stitches, I had to go to the hospital. Five stitches, two hours and three thousand dollars later, my nose was back in one piece. If I had not had insurance, I would have had to come up with all that money, instead of the $250.00 deductible. If I could not, the hospital would have had to eat it, since, unlike my nose, you can't get blood from a turnip. And this is where the problem comes from. When poor people use the E.R., that costs the hospital a lot of money. (I will agree the costs are inflated, but that is not what I'm addressing here) Since they are poor, and cannot pay the thousands of dollars the hospital visit costs them, ultimately the bill never gets paid, and the hospital is out that money. Sure they might pursue debt collection, but the poor person really has nothing to lose, and declares bankruptcy, and so, the debt remains unpaid. But not really, because, unlike thirty years ago, most hospitals are no longer charities, they are for profit companies. Even the charitable ones are expected to break even; long gone are the days when the church collection plate funded the local hospital. This means that the money to cover the unpaid bill has to come from somewhere. And guess where that is. Right, your hospital bill and mine. Everyone with insurance who goes to the hospital subsidizes the unpaid medical care that the poor receive. In fact, the uninsured add approximately $1000.00 to every insured family's premium according to Families USA. Since this sort of thing was judged a tax by the Supreme Court, I guess that you could say every insured person pays a $1000.00 tax through their insurance premium to cover the medical bills of the uninsured. Therefore, the people who can afford to be, and actually are responsible subsidize those who cannot afford medical insurance through a privatized taxation scheme, and the rest of the people get off scot free. On another side note, this is the reason for the mandate; it limits the people who are trying to game the system by not buying health insurance when they can afford to. If you want to talk about freeloaders, those are the real ones. The poor are not the slackers here. So how does this demonstrate that the Republicans are either incompetent or evil? By not expanding Medicaid as set forth in the A.C.A., the Republicans are shifting the cost of medical care for the poor from the government to private citizens through the de facto tax of inflated medical costs. And yes, I do realize that Medicaid is funded through a genuine tax. However, that share of income tax that funds Medicaid averages out to about $85.00 per person per year, which is significantly less than the $1,000.00 per year people pay in increased insurance premiums due to the uninsured poor. Admittedly, this is the average tax burden increase for the middle class, the rich pay much more, sometimes a few thousand dollars per person at the high end of the income scale. That is what progressive taxation means, the more you make, the larger your share of the tax burden, because those tax rates impose far less on impact on the wealthy. Since the Medicaid expansion is almost entirely subsidized by the federal government, and will be funded at least 90% even once everything is in place, these states are sacrificing the poor on the altar of conservative ideology that in no way reflects how the market really works. So either the Republicans do not realize that it is actually better for the overall economic health of the middle class and of the country to fund medical care for the poor through the Medicaid system, or they are deliberately making medical care more expensive for a middle class already stretched too thin. It's up to you to decide which is the correct interpretation.